There is no way that you could have lived in Bangalore and not heard of Bookworm or Blossoms. For a bibliophile like me, bookstores are like candy land, and these two stores form the cake and the cherry on top! As a child while I was just discovering reading, most of my books were from the school library or the library near home that I had taken a membership at a measly sum of Rs. 50 for a year. Buying books were never on my mind as I did not have enough money and I was getting to read more than enough anyway. Once I left school and had exhausted most of the books in the library next door, I began saving up money to buy books. I had finished reading all the Enid Blyton and Nancy Drew books by then and was just discovering Sidney Sheldon. Unfortunately for me, the library did not stock much of these, so if I wanted to read more of him I had to buy them. Buying back then meant those pirated copies of books that were sold on footpaths. Two books for thirty to fifty books was a steal back then. 'The Stars Shine Down' and 'The Windmills Of The Gods' by Sidney Sheldon were the first books that I've ever purchased. Thus began my collection that has increased hundred fold now. When I started college and had some moving around money thanks to the part-time jobs I did during weekends and holidays, I began hunting for good bookshops. Closer home there were very few. Once while enjoying a cup of coffee at the coffee-day on M.G Road, I spotted Bookworm and stepped in. Nostalgia heavily struck and I was transported back to my childhood. Also, my dream of owning a private library at home was coming true. Krishna, the owner of Bookworm started selling books from a small shop on the pavement. After a few years, in 2003, he started Bookworm and there has been no looking back. The original store is located at the center of Shrungar Complex on the main MG Road which also has an entry from the Church Street side. Since then he has opened two other stores, one on the busy Brigade road and the recent one on Church street. The best part is that if you do not find a book in the first store you are bound to get it in either of the other two, and they are just barely 100m away from each other. While I have visited all three of them, my heart beats for the original one on M.G Road. It is a treasure trove and you can find old and new books under the same roof in perfect condition. Bookworm is responsible for most of the book collection that I have at home today. They buy and sell books. If you buy a book from here, you can return it later and get store credit up to 70% of the price you paid. I love buying used books from here. There is something fascinating about used books. The almost yellow pages, that smell of wood and the feeling of someone else having touched those same pages makes for a painting and a poem in my head. When some really good books don't get returned, you get the new ones. I do have a fair collection of new ones too, but my first preference is always old books. The people here are so friendly and instantly know where what book is kept. If they do not find it, they check with their other stores and get it for you. Recently, my husband and I invaded this place picking up his favorite comics, Asterix. As and when he receives a copy of it, he calls us and we go collect it. Bookworm will always be Disney land for me. It also has been listed on the Lonely Planet and thanks to this, Bookworm has many foreign clients too. Blossoms is again a few minutes away from Bookworm but I only discovered it much later. Located in Church Street, Blossom Book House was started by Mayi Gowda a former engineer, who quit his job to sell books instead. Boy, if only I had the guts to do that! Blossom Book House or Blossoms as it is popularly called is spread over three floors and they have books from every genre in every Indian language possible. Whenever I need a break from anything, I visit this place and just walk around floor to floor looking at the high bookshelves and taking in the smell of books and wood. They too sell old and new books and I always look for the old ones first. The thought of walking into Blossoms makes my heart smile and the aura of this place is nothing short of magical. As I take the stairs up every floor, it is like entering never land and I never want to leave. Even the stairways are stacked with books and I always stop to check them out before entering the floor itself. 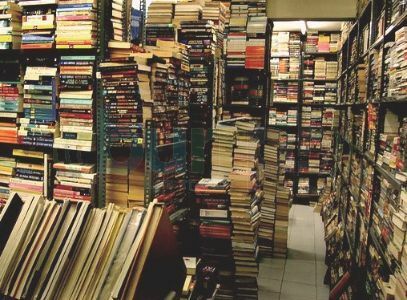 With over 2 Lakh books spread over three floors, Blossom Book House is the largest second hand bookstore in India. Now that I have a Kindle, I do buy ebooks and occasionally do order from Amazon for books due to the lack of time, but given a chance I would always walk into a bookstore and buy books. Not any book store, just the ones I have mentioned above. We of course have other bookstores in the city like Gangarams, Crossword and Landmark; but they never give me the feels that I get when I am at Bookworm or Blossoms. And buying books online has no feel what so ever. Of course I am happy to have received the book and read it, but the thrill of searching for it, getting many used copies and making a selection is something else altogether. I always visit these places with a list of books I want to buy. But I always come back with twice the number of books that I intended to buy. And most of the times, the budget remains the same. What's not to like? Bookworm and Blossoms are equally responsible for feeding and nurturing the bibliophile in me as much as the two libraries that gave birth to the reader in me. I plan to have a reading room in my house one day. A room that has oak bookshelves from floor to ceiling and a cozy reading nook in the corner with a large window that brings in ample light to facilitate the reading. I would be raiding these two stores then. Not only because I want a huge collection of books, but because I want a part of them to be a part of my house. They already are a part of me anyway. Aha! How brilliantly sorted you are. I love these two bookstores! 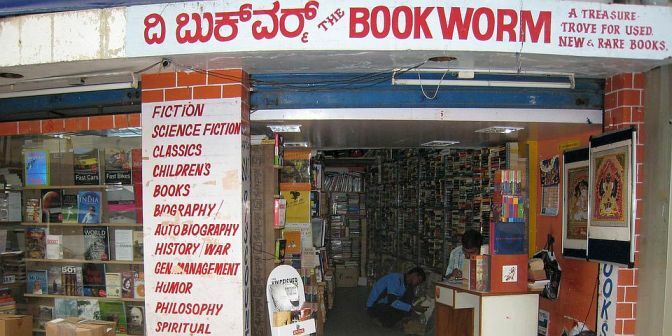 Like you said, if you are a Bangalorean and a book lover, you can't not have been here! Great to know the story behind the stores! Closer by, I visit Sapna's but it doesn't have that old world charm like these two! I somehow hate Sapna's for some reason. Too polished and expensive they are! Love both the places. I somehow think Bookworm is a bit more pricey than Blossoms. Is that true? Hmm. I have my own personal second hand book caves here in my area and have amassed a massive library thanks to this. Must see your bookshelf some day! Hugs! I also started reading Sheldon after Nancy Drew and Enid Blyton. I used to love Arthur Hailey and Robin Cook. I was a sci-fi lover in those days. How did I miss this treasure... oh god I am feeling devastated that I didn't know about them. No wonder you read so many books in a month. They look like a perfect bibliophile paradise. It's better to give the books here than selling it off to thele-wala. You should visit them! They are so awesome. Haven't heard of Bookworm? Okay, I don't know you anymore. I love Blossoms! I didn't want to get out of Blossoms when I first went there. Yes, I always love looking for a book in a bookstore rather than buying it online. It is an adventure in itself. And I am with you in the struggle of not being able to buy books while growing up. It is only now that I've lots to read. And yes, I would like to have a reading room with huge shelves of books of my own in my house! Hahaha, I love such stores too. I have heard of this place for years (Blossoms) but sadly, have never been there in my life. This may end up being a Bucket list thing in the end! There's nothing like browsing through the books in a book store. I loved Landmark in Lucknow and now Crossword in Jaipur. I havent been to a store that buys and sells books... I wish there were such stores in Jaipur too! I like Landmark and Crosswords too, but something is missing at such places. Try visiting these two places if you ever visit Bangalore. You'll love it I'm sure. I have always bought books online. :p But I can understand by your post how special a place like that can be. I love browsing through books when I visit book fairs, but that's about it. I don't visit book stores, but I guess I should because that's a good feeling and you can feel the time fly when you are busy browsing. Blossoms seem to be a fab place by your post and the comments that I am reading below it. Online buying is boring yaar! Come to Bangalore, I'll take you there. You need to feel it to understand it. How have I never been to Bookworm???? Blossoms is like the love of my life. Quite literally, in fact - did you know I spent Valentine's Day there last year? Just wandering around, looking at the shelves, falling in love, going googly eyed. The new Blossoms is apparently not as charming as the old one. I've not been there, this is just what I've heard. When I visit Bangalore next, I will go to these two places. I had once been to MGRoad for taking interviews. I was not familiar with Bangalore or MG Road, or I would have surely hunt down this place. Please find them. You'll love these places. What a wonderful place! All those magnificent books. A few rare ones among the stacks, I'd wager.